Long gone are the days when a wreath was just a circular form that came in a few standard sizes. 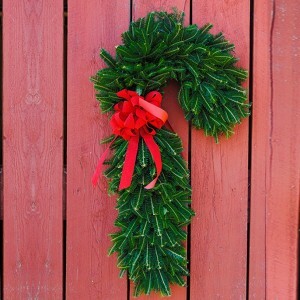 Our fresh Christmas wreaths come in a variety of types and shapes including candy cane wreaths. We sell wholesale Candy Cane wreaths that are made of live, Fraser fir branches and bough as well as some White Pine wreaths. These fun displays are a great change of pace from the ordinary circle wreaths that you see everywhere during the holidays. If you are looking for something unusual and different to sell on your retail lots, order some Candy Cane wreaths from us and the will surely go fast. All of the wreaths are created from freshly cut evergreens that are harvested on our Christmas tree farms in NC, VA, and WV. Our family owned and operated farms won awards at the 2015 National Christmas tree Association contest and we have the honor of supplying the Vice President with a Christmas tree for the 2016 Christmas year. Candy canes are loved by all during the holidays. Our Candy can wreaths are made from live, fresh cuttings. Natural in color, the green shaped Candy Canes are a hit with children of all ages. You can add Christmas ornaments, ribbons and bows to them as well to give them some extra color, but the candy cane wreaths themselves look just fine au natural and all green. Some choose to tie one solitary red velvet bow near the top of the curved part to add a cute flair. These wreaths may not be considered as regal as the grand Fraser fir wreaths that are classically shaped, but candy cane wreaths have a place all their own in Christmas décor. Looking for other fun specialty shaped wreaths to decorate with during Christmastime? We also create Christmas tree shaped wreaths, heart shaped Christmas wreaths and the classical circular wreaths in a variety of sizes. Think of the fun that you could create in various windows of your home. Children’s rooms are the perfect spot for a fun shaped candy cane wreath.